Eye Exams By Doctor Of Optometry. Prescription Eyeglasses and Sunglasses Are Available And Most Jobs Can Be Done With 1 Hour Service In Our In House Lab. Whether You Need A Progressive Lens, Single Vision, Bifocal or Computer Lenses We Can Help You. One Hour Service and Optical Lab Available. This lens type has a single focal point that can be used to correct myopia(distant) or hyperopia(near). It can also be modified by the optician for intermediate correction such as computer use. As the name implies, this type of lens has two focal points. Above the line provides correction for distance and below the line contains the correction required for reading. This type of lens has a visible line that separates the distance from the reading portion. With only two sections of the lens, bifocal lenses do not account for the intermediate zone of vision, therefore, it can be difficult to view things like a computer screen with this type of lens. The reading portion of the lens can come in several shapes including a round segment or a half moon. This type of lens is similar to a bifocal but provides a distinct section between the distance and reading that is usually an intermediate prescription(about the length of your arm or a computer screen). Without any visible lines on the lens, progressive lenses offer a smooth transition from distance through intermediate vision to near vision. Progressive lenses also offer vision correction for all of the in-between vision zones. 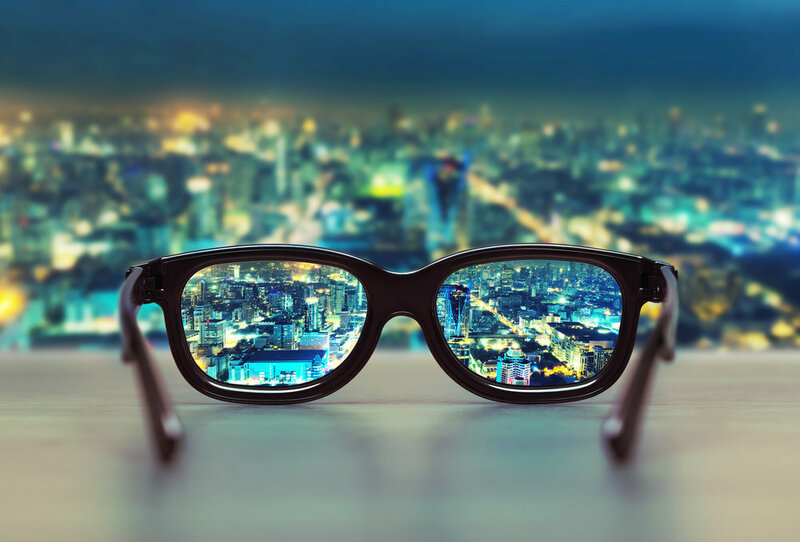 So instead of just having two or three different viewing zones, progressive lenses offer vision correction that progresses in power from the bottom to the top of the lens. This progression of correction eases eye strain by providing the most natural vision correction. Some people also call these no-line glasses, no-line bifocals or multi-focals. Modern technology is continually improving the design of progressive lenses with the highest quality progressive lenses being Digitally Surfaced, commonly called "High Def lenses". Progressive lenses more closely mimic the natural vision that you enjoyed before the onset of presbyopia without the "Image Jump" that is common in bifocals. Modern technology governs our life and makes it easier, both at home and at work and we need a lens that is tailored to our specific needs and allow for a relaxed posture. These lenses offer very large fields of vision from near to intermediate distances and can be customized to meet your specific office needs. Transitions: Fully clear indoors and reactive to UV light outdoors as they get darker in brighter conditions and adjust in intensity to partially sunny or cloudy days. This lens type also blocks 100% of UVA and UVB rays and can be fit into any prescription and lens type. The technology has been rapidly improving and the lenses lighten and darken much quicker than the older photochromatic models and are available in Grey, Brown and Graphite green. The latest models offer polarization and XtrActive which are uniquely designed to protect your eyes from the brightest sun and harsh artificial light. High index lenses are required for strong prescriptions for nearsightedness, farsightedness or astigmatism. The advantages of high index lenses are thinner and lighter lenses and better visual aquity in the peripheral. This lens option is available in all lens types. Polarized sunglasses have been popular for years with boaters and fishermen who need to reduce reflected glare from the water surrounding them. But now that many others who spend time outdoors have discovered the benefits of polarized lenses, interest in these types of sunglasses has soared. Besides boaters, outdoor enthusiasts who benefit the most from polarized sunglasses include skiers, bikers, golfers and joggers since all of these activities require the elimination of glare for optimum safety and performance. Polarized sunglasses can be helpful for driving, too, because they reduce glare-causing reflections from flat surfaces, such as the hood of the car or the road's surface. Some light-sensitive people, including post-cataract surgery patients and those continually exposed to bright light through windows, may also choose to wear polarized sunglasses indoors. Polarized lenses contain a special filter that blocks this type of light, reducing glare. Scratch Resistant Coatings are a must have, as they protect both sides of your prescription lenses and make them much harder to damage. This coating comes with a one year manufacturers warranty on lens scratches. Anti-reflective coating, also known as AR, anti-glare, no-glare or glare-free coating, can provide benefits to your vision. AR coating is added to the lens to reduce glare caused by light and makes your eyeglasses more visually attractive. AR coatings virtually eliminate all reflections from the front and back surfaces of the lens. Without reflections, more light is able to pass through the lens which optimizes your vision. Past problems included a constant need to be cleaned, peeling and smudging. However, AR coatings have seen several improvements over the past few years and it is highly recommended to use this type of coating, especially for night time driving and/or computer use. The increased use of digital devices offer new dangers that require proper protection and precautionary measures. These digital devices emit harmful blue-violet light causing digital eyestrain and eye diseases such as AMD(Age Related Macular Degeneration), a chronic, progressive disease that causes the degeneration of the retina. There are specific AR coatings that can block out the bad light and let in the good and come highly recommended for patients that spend over 6 hours a day on digital devices. Total Vision and Hearing is dedicated to providing comprehensive eye exams by independent Doctors of Optometry. It is important to do regular eye exams to check the health of the eye as well as determining the proper prescription for eye glasses. Ask us about Direct Billing!